Today on the centenary of the landings at Gallipoli much focus will be on the Australian and New Zealand troops who landed there in April 1915. 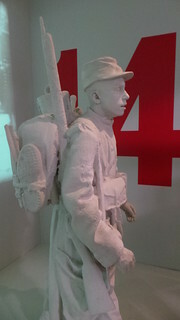 One of the forgotten combatants of the campaign French soldiers who served alongside their British and Commonwealth comrades. Some 80,000 French soldiers fought at Gallipoli as part of the Corps expéditionnaire d’Orient with almost 27,000 casualties. 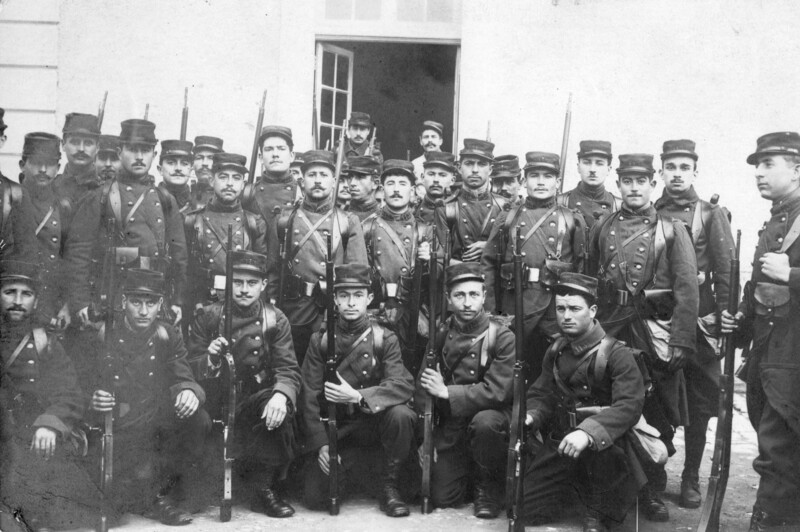 Many of the French troops were from Colonial units drawn from the far corners of the French Empire. 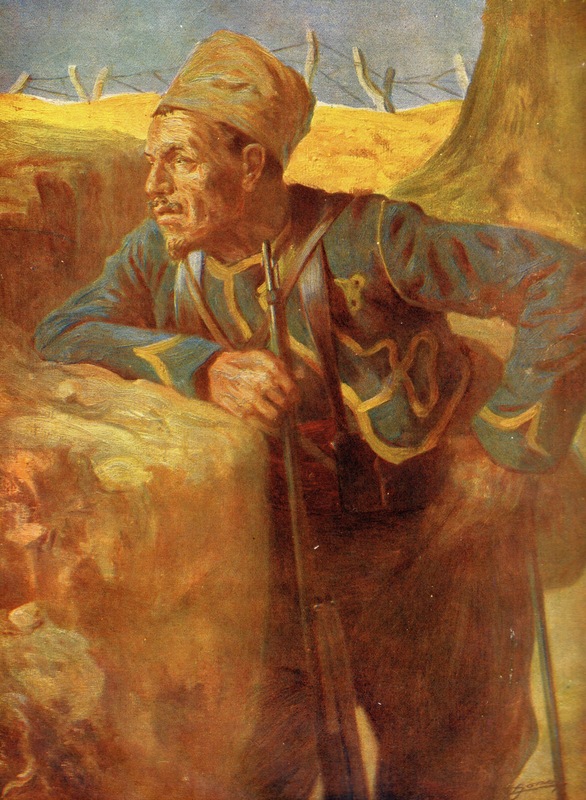 This image comes from a French source and depicts a French Zouave in the trenches at Gallipoli in 1915 from the 17e division d’infanterie coloniale who took part in the fighting at Krithia. This extraordinary image shows an early war German position on the Western Front during the winter of 1914/15 – so exactly a hundred years ago. Little damage from shell fire is visible, but on the left in the trees the head of a German soldier peaks out from above his trench and to his right there also appears to be a periscope. This would mean the image would have to have been taken in No Man’s Land, which makes it even more unusual as the enemy would have to have been to the rear of the photographer. A close inspection of the barbed wire shows it covered with snow; glistening in the winter sunshine. The old world had ended; man had made a new world on the Western Front which grow even more terribly as the next twelve months evolved. A century ago this week the Battle of the Marne was raging close to Paris as the outcome of the German invasion of French hung in the balance. The ‘miracle of the Marne’ saw an Allied force of British and French troops halt the German Army at the very gates of Paris and it was not only the largest battle of 1914 – with nearly 2.5 million troops involved – but arguably the most decisives of the campaign. While the French Army had demonstrated in the Battles of the Frontier that it fought in an outdated way, resulting in heavy losses, battles like the Marne showed that the French often had an edge in technology and the ability to adapt. 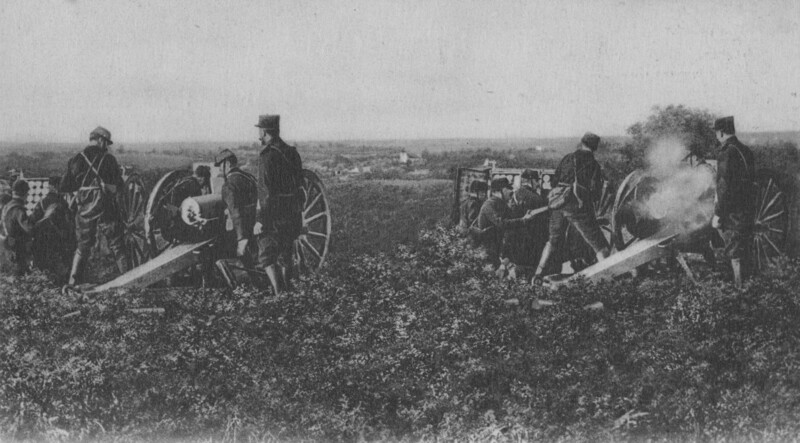 The famous French 75mm field gun seen here was one such example; certainly the best field gun that went to war in 1914 and arguably one of the best of the whole war. It’s rapid rate of fire and accuracy meant that it increasingly gave French gunners an edge on the battlefield, something they would carry through the entire conflict. A century ago today the Old Contemptibles of the British Expeditionary Force were a week into the Retreat From Mons and it is easy to think there was some sort of pause in the war at this stage, but the fighting went on as the Belgian and French forces continued to face the German advance. The town of Rethel in the French Ardennes had seen heavy fighting and more than 5100 townsfolk had fled the area. On this day in 1914 the town was set alight with more than 70% of its buildings being destroyed, as seen in this German field postcard. Rebuilt postwar, the town was once again very badly damaged in the Battle of France in 1940. 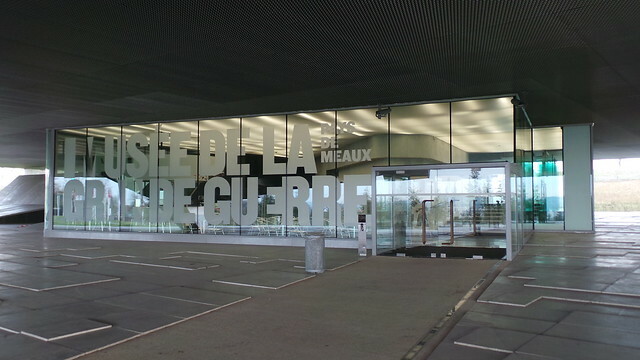 The Musée de la Grande Guerre opened in the French town of Meaux – in the heart of the 1914 Marne battlefields – in late 2011. While this is its second year and has had good visitor numbers, I do not think it has quite reached the radar of English speaking visitors as yet and I myself have only just had a chance to pay the museum a visit. I must confess that I did approach the visit with some trepidation; modern museums can often have themes which at times seem remote from the core subjects of the Great War and occasionally go for audio-visual over objects. In the case of this superb museum my fears were unfounded as it proved to be one of the best museums I have visited in a long time and now is in my top five WW1 museums in the world! The visit at the Musée de la Grande Guerre starts with a short film taking you back to the origins of the Great War and the Franco-Prussian War. You then proceed into the pre-war galleries which emerge into a display of soldiers marching to war in 1914 and the main hall. This hall is packed with a Marne Taxi, pigeon loft, WW1 aircraft a FT17 tank, artillery and two large trench displays. Off of it are other rooms which follows themes or the timeframe of the war, equally packed with fascinating objects, imagery and artwork. Two and a half hours here just flew by and it is one of those great museum where I know I shall return each time and see something I missed previously. The trench displays were particularly effective; a trench ends on a wall where the movement and activity in the trench is cleverly blended with archive film from WW1 – see below. The museum has a well stocked bookshop at the end, good, clean toilets, safe and plentiful parking, and a nice little cafe which does drinks and light snacks. You cannot take bags inside but there are lockers to leave them in. It has good disabled access for a French museum and the staff are all very friendly. 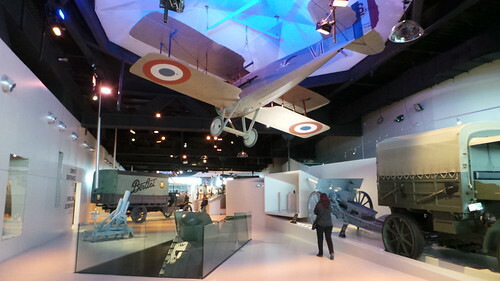 I cannot recommend the Musée de la Grande Guerre enough and combined with a visit to some Marne battlefield sites close by, this makes the Marne an exciting battlefield to visit. 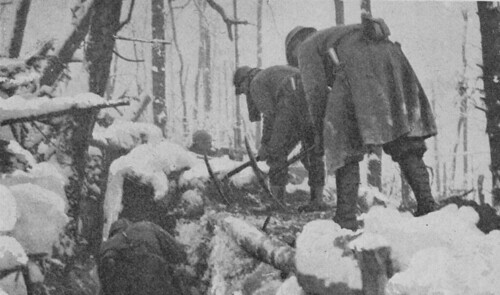 Working in the snowy conditions of winter on the Western Front was a hard task for all soldiers. 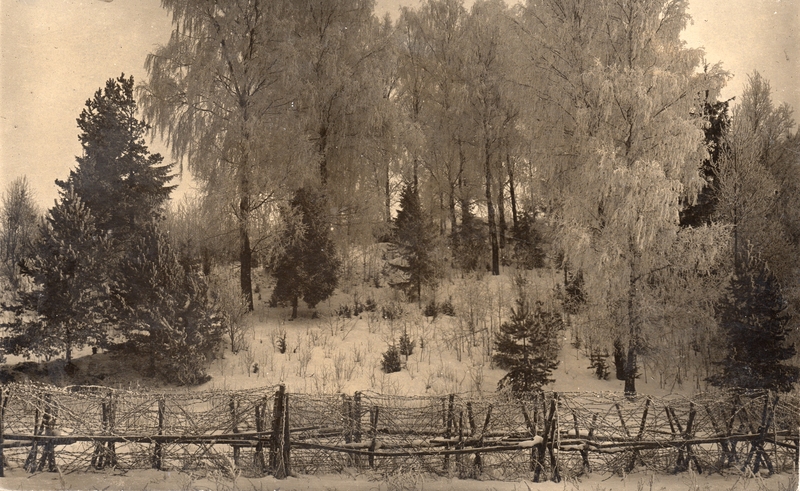 While the work kept you warm, the frozen conditions on the battlefield often made such work near impossible in the first place. This French image from La Guerre Documentee shows a group of French Poilus working on their trenches in a wooded area with picks; so hard is the ground it seems that shovels are not enough. There has been a heavy snow fall and one man keeps watch over the far parapet, but this is likely to be a reserve position away from direct observation otherwise the soldiers would not risk getting up in the open like that. The soldiers are all wearing their great coats, have gloves and scarves, and the image gives us a good insight into how difficult life was on the Western Front during the winter months.